Mainz v Bayer Leverkusen was all about the Karneval celebrations in the capital of Rhineland-Palatinate with Mainz even playing in a special Karvenal shirt tonight. Mainz wanted to create a party atmosphere at home against Bayer Leverkusen, but by halftime, they were already convincingly beaten by an all-out attacking Bayer side. “We had a good structure going into the game, even though we had some bad passes to start with,” Leon Bailey said following the game. “We managed to score goals, and that is the most important thing. Second half we had the game under control and took the chances when we could and were enjoying ourselves out there,” Bailey added. 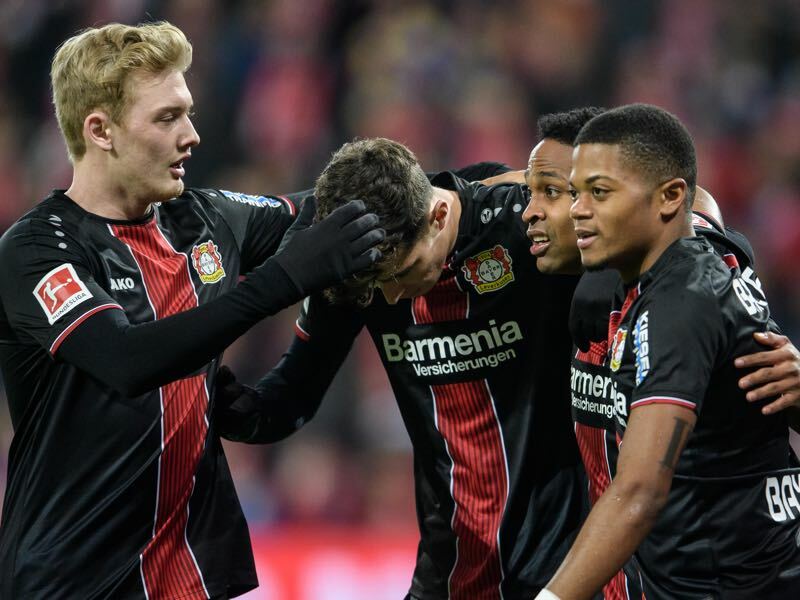 One player, who, in particular, enjoyed himself out there was Julian Brandt. The attacking winger was voted the man of the match and was involved in four goals. “He is a tremendous player, you know Julian is a pacy player. He can score he can give assists, and that is his quality, and he is our offensive threat, and he does it very well,” Bailey praised his teammate. “We have played a good game against a very good team. The first half was very open, and we could have both scored more goals,” Peter Bosz said after the game. “We have good players, and we deserved to win. Even at halftime, I was not fully convinced, because of my experience against Schalke last year,” he added. “I have seen many games from Julian. But he is a midfielder and a great player, and he needs to have the ball, he rarely loses the ball. A good player,” Peter Bosz said when asked about Brandt’s new role in midfield as a number eight rather than a winger. It is due to that new role that Leverkusen can afford to play free-flowing attacking football, in fact maybe Brandt was the player missing in Dortmund’s system last year. Julian Brandt is not the only player that has been somewhat re-invented. Playing together with Brandt in a three-man midfield was Kai Havertz. 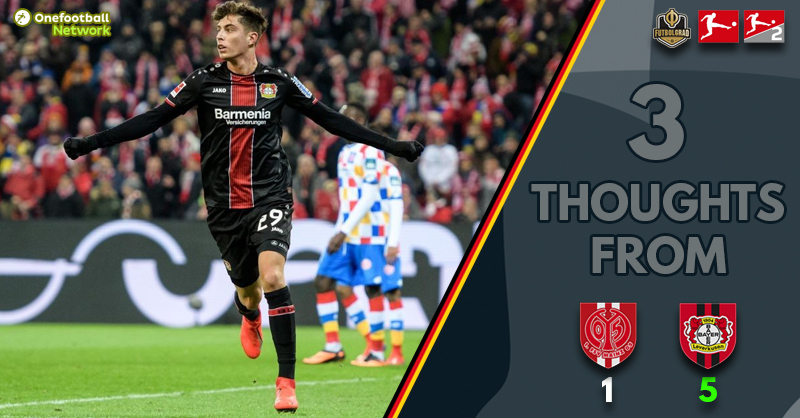 One of the biggest talents in German football Havertz seems well suited for the number eight role, but with two attacking midfielders behind three forwards Leverkusen could find themselves in trouble against more attacking minded sides. Against Bayern last week, in fact, Havertz’s injury was one of the catalysts for the club’s victory. With Julian Baumgartlinger on the field, Leverkusen were more stable in midfield and eventually won the game against Bayern 3-1. Baumgartlinger also came on in the second half today but then suffered an injury. “He is being treated, and it looks like he broke his nose,” Bosz said after the game. With Baumgartlinger potentially out Havertz and Brandt will continue to anchor the midfield, even if it means a lack of balance. The game was supposed to be all about the Karneval celebrations. Mainz known as the Karnevalsverein in Germany had even issued a special shirt for the occasion. Checkered in clown colours Mainz wanted to play attacking football. “We had chances to score goals in the first half, but our attacking style led to goals against us because of unnecessary losing the ball,” head coach Sandro Schwarz summed up the first half. “In the second half, Leverkusen controlled the match, but I want to compliment the fans. They kept up the atmosphere and showed sympathy towards a young team that needed support,” Schwarz added. The fans, indeed, were spectacular. Even when the game was long lost they kept on singing. But perhaps that was due to the approaching Karnevals season in Mainz, but perhaps it was also more. Mainz’s side is still young and needs the support in what could be a difficult end of the season for the club.